Welcome to WordPress the new journal by a dear friend. She always provides Inspiration to fuel my many adventures! 7 hours in the life of a mother! 4:00pm: change both girls nappies. write and send email to builders regarding bathroom fittings. * Select a UFO and work on it for at least 15min (more time is even better). Participation can happen anytime on Wednesday (based on your time zone). * Working on the UFO automatically turns it into a WIP. * You can continue to work on it through the week if you want to. 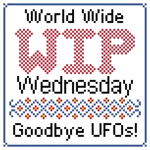 * Next Wednesday you can continue with the same project or pick a different UFO. * Anything towards finishing the project counts: stitching, sorting threads, unpicking a mistake, finishing the stitching into a pillow, framing, looking for the UFO or parts thereof, etc. * If you find “why-did-I-start-this” UFOs… get rid of them! Either give them to someone who likes them or repurpose the materials if you can. That also counts for WIP Wednesday. * Those rare people that dont have UFOs can join too and work on their neglected WIPs! * Or if you only have 1 WIP: Please volunteer to finish some of my projects. No, just kidding! Simply work on your WIP an extra 15min at least. * For those busy bees who are stitching to a deadline (Christmas, birth announcements, etc)… use this as an oporttunity to either get lots done on your deadline stitching. 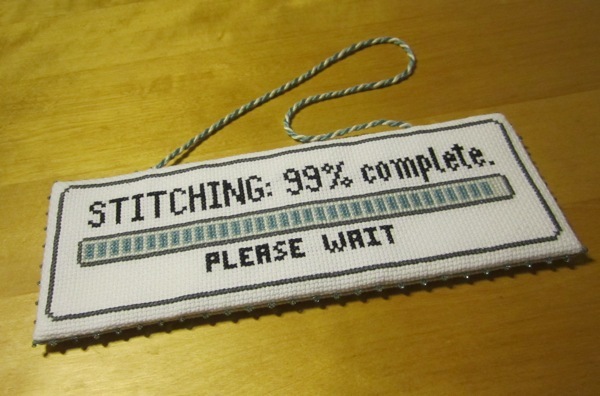 Or, even better, use it as an opportunity to stitch something for your own pleasure! * You are encouraged to post pictures of your UFO and update when finished (let us know how long it took to finish once you picked it up again). Updates at the end of just 15 min work are not really needed unless you stitch with machine like speed… better spend the time it would take to post an update picture stitching. Of course, updates at major milestones are welcome! As for me, I’ll continue to work on Summer in My Garden! I am not sure what I did right today… a miracle happened and both my girls are napping at the same time (2years-10months and 3months old). They’ve mastered sleeping overnight in the same room… now with a bit of luck nap time is heading that way too. The husband and dog are out on a bike ride. That means some rare quiet time for me! I am taking the time to enjoy a cup of pu-erh tea, a slice of banana bread and a read of 1001 ways to relax (thanks Bonnie!). Pu-ehr is Sherlock Holmes tea of choice. I like to think that its named after the sound people make when they first try it… its like the Guinness beer of teas. This is the one I picked up as my WIP Wednesday UFO. I am ashamed to say that I had to clean out the spiderwebs before I could actually work on it… The piece is Summer in My Garden by Mirabilia. 1st World Wide WIP Wednesday!!! Its been a fairly quiet week in terms of crafts. I did manage to finish this little sign for a good friend of mine. 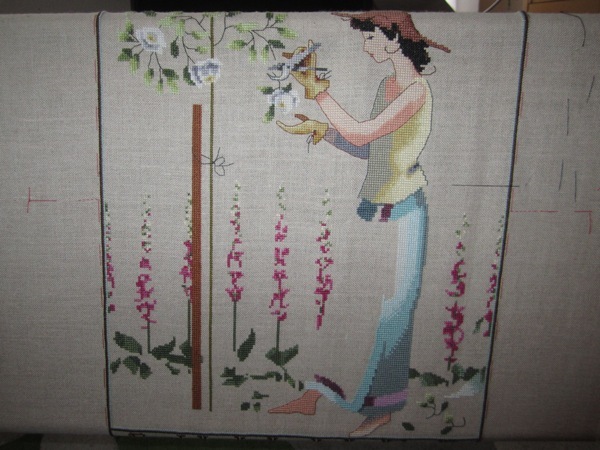 Its the companion piece to Stitching Please Wait. It is now on its way to Australia, where it will live in my friends craft room. I’ve always prided myself at being a brave person and generally doing the right thing. An event last week left me pondering about what exactly the right thing is. We were at a large bank getting some cash out when 2 guys walked in. By “we”, I mean myself, my 2 little girls, a good friend of mine and her daughter. The 2 guys looked non-threatening, one of them was carrying a small courier bag. One of the guys said to the other “I take this door you take the other”. This raised the hair on the back of my neck as I looked at where my 2 girls and my friends daughter were and pictured a bank holdup. Looking around I saw no security guards and no other children around. A second glance at the guys showed that they were lining up to get to a teller, no doubt the comment was directed at getting through the lunch time bank crowd as quick as possible. Nonetheless, I couldn’t wait to get out of the bank with all 3 girls. Fortunately, my friend was done and we walked out almost immediately. It felt like a cowardly thing to do… it still kind of does. At the same time cold logic tells me my instinct at the time was right, get the 3 girls out of there. Their safety is my first and main responsibility. Had I truly felt that the guys were really a threat I had the option to call the emergency number and warn the police. We were around the area for a bit longer and heard no sirens, so the guys were really just there on an errand. Poor choice of words on their part. This little event somehow is stuck in my mind since it gave me a taste for how I would re-act in such a situation. I have mixed feelings about it… but there you go, these are the mothering years of my life. 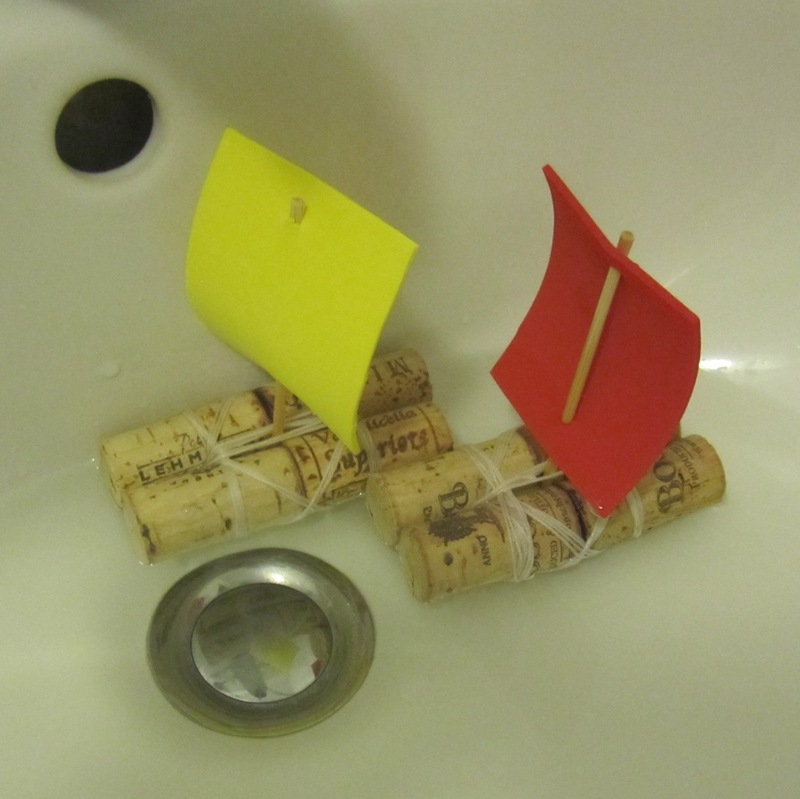 How To: Cork boat rafts fun! A few weeks ago I was looking at a handful of corks and wondering what to do with them. Thats when I remembered how well cork floats! This will provide entertainment at least twice: first building the rafts and later playing with them. You’ll need: Corks, some string (we used crochet yarn), sticks and something to make sails with (reporposed foam, plastic or even tree leaves will work). And of course, your little ones as helpers! 1. Tie the string to one of the corks. Tightly! 2. Grab a 2nd cork. Place it alongside the 1st cork and start winding/wrapping the string around both corks, use 8 and 0 shapes… Tightly! 3. Now get corks 3 and 4, using the same string repeat step 2 with these corks. Every now and then wrap the string back around the first 2 corks. Keep alternating. Tightly. 4. Run a few loops between the 2 pairs of corks. Tightly. 5. When everything is holding together, tie off the string. 6. Cut a stick to the size you want for a mast. Then just push it in where the 4 corks meet. 7. Cut your sail to shape and add 2 small holes. Slide it in place on the mast. 8. Test your boats floats upright. Adjust if needed. Hopefully this makes some sense… Looking at the picture below should help. Its raft science, not rocket science! Now take those rafts for a spin at your local fountain or pond… and have fun. Our rafts have been played with at the fountain, in the bathtub, several sinks and assorted buckets. Ila still hasn’t tired of playing with them!